As a developer you want to create cool Free Software and you want to get the result out to millions of users. Unfortunately, to get the code to the user you need to do more than just the fun stuff. After you have written your application you have to compile and package it for all operating systems you want to support. There is a large variety of Linux distributions out there and of course there is Windows and Mac too. Once you’ve build it and package it, you have to create a web page with information about the application and some features like commenting and a bug report tool. Next step is to promote your product on twitter, Facebook and at conferences; and try and get it into distributions. Once the distributions release some users hopefully turn up and start giving feedback; resulting in changes to the application. A new version is released and you have to start all over again with the boring stuff. 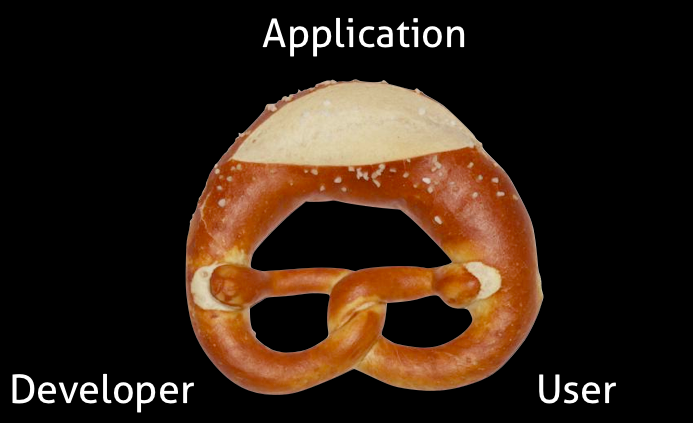 Project Bretzn consists of three parts: the building of the package, the publishing of the application, the marketing to the users and the feedback cycle back to the developer. The building part consists of plugins for IDE’s and integration with Build Services and using Lubos Lunak’s OBS Generator (yes, still looking for a new name) to automatically generate cross-platform build files. Publishing sends the app to a variety of App Stores and then markets it through announcing it on Facebook, Twitter, via a RSS feed and the Social Desktop. Finally, users can provide feedback by rating the application and commenting on it, by writing bug reports and send messages to mailing lists or forums. And all of that with one click (well, maybe a few more). Currently, Sebastian Kugler, Dan Leinir Turthra Jensen and Frank himself have been working on this for about three months. The plans are older, however, as are some parts like the OCS based App Store. The API is all open, part of the Open Collaboration Services which is on freedesktop.org. There are free server and client implementations supporting uploading and downloading of applications, abstracting Build Services and including all the social features. The API is supported and used by Intel, Nokia, OpenOffice.org, KDE and GNOME. Current features of the API include categories, screen shots, change logs, commenting, rating, search and update notification. Furthermore, applications can be either free or paid and the payment goes directly to the developer. Not all AppStore clients include all features right now, the KDE GHNS client is probably the most complete as it has been around for many years. Social features include notifications directly to the desktop using the Social Desktop API, ‘what my friends like” and “what my friends develop” and Knowledge Base integration. Over 70% of the work is done already and the team is aiming to ship in December. They are working with other openSUSE developers to make a proof-of-concept App Store for openSUSE using OBS and the other integration which will hopefully ship in the upcoming openSUSE 11.4 release. The code will soon be available on Gitorious for all to see and of course anyone interested in helping out is more than welcome. The team is looking for integration in other DE’s like Eclipse, NetBeans, Visual Studio, MonoDevelop and KDevelop. But also work on more App Stores, further social media integration and code cleanup is needed! And especially work on a GNOME frontend, in the spirit of Collaboration Across Borders, would make the team happy.